The Pixelution DOMS is a unique integration of products that provide a Digital Outdoor Menu Solution at an attractive price point. By using a custom media player and a fully weatherproof high bright screen we provide a complete solution to display and update menu contents remotely. Secure access allows local staff to change certain items on the menu throughout the day from a smart phone or PC. The 42”, 47” and 55” outdoor screens are easily readable in direct sunlight, fully water and vandal proof to IP68, and require no separate housing which keeps the overall cost down. 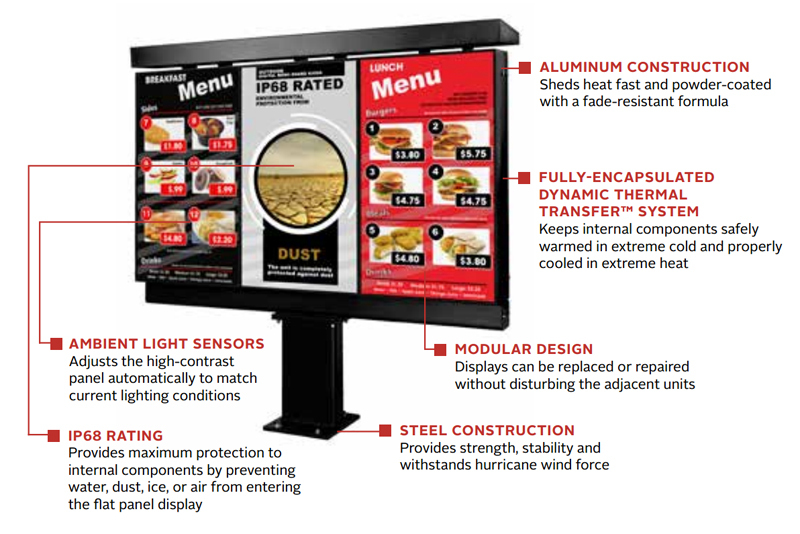 Replace static menu board signage with a Digital Outdoor Menu Solution. With optional topper and sidekicks, take your menu application to the extreme by seamlessly changing your content whenever, and where ever you like. This fully-sealed weatherproof display has thermal management systems and an ambient lighting sensor that ensures your content is being displayed without any unwanted interruptions. The menu board can also be used for standard advertising in a variety businesses. The unit offers a low operating cost, a thin profile, a modular design, and an easy installation process. Displaying seamless digital signage content has never been easier. The DOMS is system built around two major components. The first is the public facing screen. These displays are built for outdoor use in any conditions. Fully water-proof, vandal-proof, and able to operate in hot and cold temperatures, these screens are ideally suited for use as menu boards. Traditionally outdoor digital displays are a combination of indoor LCD screens enclosed in IP rated enclosures to protect them from the elements. Although an effective solution this combination add bulk and expense to your digital display. By utilising an IP rated monitor we reduce the overall footprint of the signage, simplify installation and reduce ongoing maintenance costs. The screens are available in three sizes and as Landscape or Portrait wall mounted units or 47″ free-standing Portrait totems with one, two or three screens in a single base unit. Totems can also be embellished with left, right and top kickers for static branding. With a high brightness rating the screens remain clearly visible in all lighting conditions. Standard LCD screens can appear washed out or barely visible in direct sunlight. By using an optically bonded screen the brightness level of the screen hits 1,500 nits which is at least three times brighter than standard public display screens. The second part of the DOMS system is the media player. A 24/7 professional, solid-state media player provides the content to the screen. These media players can perform a variety of tasks from a simple slide-show or video through to interactive content with social media integration. For menu systems the simplest format is a static menu board image to display your products and pricing. This basic design can be enhanced by using video and motion to create a more dynamic and engaging display. Different menus can be scheduled to appear at different times during the day – Breakfast, Lunch and Dinner. Add special promotions or events to your schedule or manually change the display from your phone, tablet or PC. For example you may have a menu for hot drinks and snacks. The weather changes, the sun comes out and the temperature rises. At the touch of a button you can change your display to Cold drinks and ice-creams. Changes to the display at a local level can be either the whole screen or individual items. You can give your staff secure access to only certain items, for instance ‘Burger of the Day’, to allow them to make changes specific to their outlet. Management of all screen content can be achieved locally via a PC or over the internet to enable nationwide control. Roll-out changes to your menus nationwide in an instant. This helps not only with menu changes or promotions but enables you to make small changes, such as nutritional information, without the cost and expense of a complete print run. Remote management can be achieved over the internet via a corporate VPN connection or a subscription based Cloud service. • Quickly update menus and content to reflect recent price changes or specials, item offerings, caloric content etc. If you are looking for an outdoor digital signage solution then contact us on 01462 433558 to discuss how this system can help revolutionise your marketing.